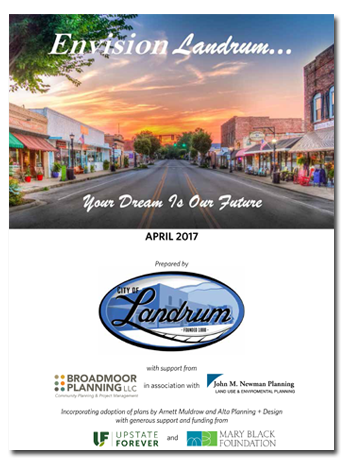 Upstate Forever supports the City of Landrum's ongoing efforts to implement Envision Landrum: Your Dream is Our Future, a comprehensive plan update adopted in August 2017. In 2019, those efforts will focus on a zoning code update - one anticipated to include code revisions to better support 1) infill development in single family residential zoning districts 2) retail uses in the city's Downtown Overlay District and 3) modifications to enhance sidewalk and trail requirements and standards. For the latest updates on Landrum’s zoning code update, check the city’s website, calendar and Facebook page. In January 2017, Tee Coker from ALTA Planning + Design presented the final “Walkable Landrum” pedestrian master plan to Landrum City Council. “Walkable Landrum” will inform continuing efforts on Landrum’s comprehensive plan update. Alissa Ritzo-Duncan, Broadmoor Planning LLC, presented at the January City Council meeting as well, focusing on her firm’s work to support completion of Envision Landrum: Your Dream is Our Future. The aggressive schedule for completion of the comprehensive plan update included a draft document by summer and public meetings for final public input on the plan in June, July, and August. The document was finalized in August of 2017. Blake Sanders, ALTA Planning + Design, launched “Walkable Landrum,” a bicycle and pedestrian planning project that will identify opportunities to enhance multi-modal transportation, especially to improve access to healthy food venues in the area. This Spartanburg Herald-Journal article describes the project and how it will benefit the community. Attendees at the May 3 meeting participated in an electronic polling exercise to refine data collected through various means since Envision Landrum: Your Dream is Our Future launched in early 2016.